Q. Are there different types of boat trips to the Skelligs? Q. Can we land on the Skelligs? A. Yes, landing on the skelligs is permitted once you travel on a licenced boat. Q. What is the cost of the trips? 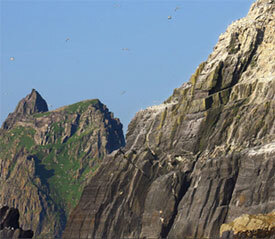 The cost of a Landing trip to the Skelligs is €100 per person, during the permitted season – May 14th – 2nd October 2019. The cost of the Eco Cruise is €40 per person, family rates are available. Q. When do I need to book the Eco Cruise around Skellig Michael? Q. How do I make a booking for the eco cruise around the Skellig Michael? For bookings made by e-mail for the Eco Cruise the departure time must be confirmed by phone on the morning of the departure. Q. Are the Eco Cruise trips Around the Skelligs weather dependant? A. Yes- The Eco Cruise trip around the Skelligs is weather dependant. You need to contact us the morning of your cruise to discuss the weather conditions. Q. When do I need to book the trip to Land on the Skelligs? A. You would need to book your trip to Land on the Skelligs well in advance of your preferred date. anything upwards of 3 months. Q. How do I make a booking for the cruise to Land on the Skelligs? The bookings to Land must be confirmed by phone two days before departure. Q. 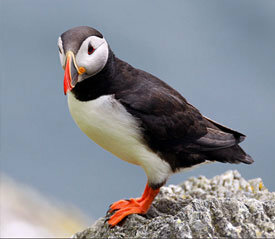 How often do trips to Land, depart for the Skelligs? A. The trip to Land departs daily from the 14th May until the end of September. This trip is weather dependant. Q. How many Landing trips per day are you allowed? A. Each boat is permitted one landing trip per day. Q. Are the trips to Land on the Skelligs weather dependant? 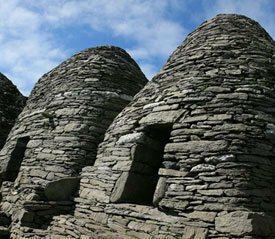 A. Yes- The Trips to Land on the Skelligs are weather dependant. You need to contact us 2 days in advance of your departue date to discuss your trip. Q. 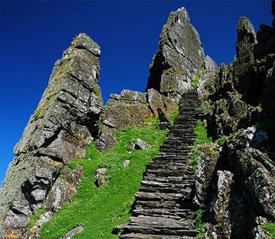 What is the departure time for Trips to Land on Skellig Michael? A. Trips to Land on Skellig Michael depart from Portmagee Marina @0830 hrs You will need to be in Portmagee 30 minutes before departure time. Q. Are there toilets on board our boats? A. Yes- There is a fully functioning toilet on board, located in the For’ward cabin. Q. Are our boats Licenced by the Dept of Marine? A. Yes-The boats are licenced by the Dept of Marine and have a P5 licence. They undergo a very intensive inspection every 2 years before the licence is granted. Q. Do our boats carry lifejackets? A. Yes – The boats carry a full compliment of lifejacket, As per the Dept of Marine rules the passengers are not required to wear these lifejackets during the voyage. The reason being they are what is called a positive buoyancy lifejacket and very restricitve during the trip to the Skelligs. IF SOMEONE WISHES TO WEAR A LIFEJACKET DURING THE TRIP, WE WILL GLADLY ACCOMMODATE THEM We do not give out Personal Floatation devices as these are not fit for the open waters and should only be used during water sports activities such as kayaking, jet skiing wind surfing etc…. A. Quite possibly- On a day when conditions are incliment we would sometimes have 2 to 3 people who get seasick. If the conditions are good then we would seldom have people sick, unless the person is a very poor traveller. A. We are not medical people so we cannot give definitive advise on this, only to say what we observed has worked for others. Again keep well hydrated and warm until you are recovered fully. Q. Are there toilet facilities on the Skelligs? Q. Are there any facilities for the traveller on the Skelligs? A. No. There are no facilities of any nature for the traveller to the Skelligs. Q. Is the weather different on the journey to the Skelligs than that on the land? A. The weather is always different on the sea. So always bring extra clothes to keep warm. Also make sure that you bring some waterproofs with you. Q. What type of clothing should one wear or bring to the Skelligs? A. Always bring a backpack where you can have your extra clothes in the event of a change in the weather. Q. What type of footwear should a person wear? A. A person wishing to visit the Skelligs should wear – preferably a hiking boot or at the least a strong walking shoe with good supports. Sandals should not be worn nor should shoes with a raised heel.